Political campaigning ahead of the general election has heated up significantly following Monday night’s televised leaders’ debate, which saw sharp clashes between Sinn Fein’s Gerry Adams and Fianna Fail leader Micheal Martin. Also appearing in the five-headed debate was Labour Party leader Eamon Gilmore, Fine Gael leader Enda Kenny and Green Party leader John Gilmore. Political commentators and discussion websites generally rated Mr Adams and Mr Kenny as putting in the strongest performances of the night. 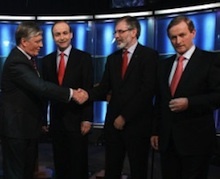 In last week’s debate on TV3, neither Kenny, who refused to take part, nor Adams, who was not invited, were involved. At a crucial juncture, as the debate turned to the issue of social welfare fraud, Mr Adams pointed to high level of fraud and corruption among the ‘golden circles’ of the political establishment in Dublin. He was then attacked by Micheal Martin for raising the issue “among people down here in the Republic”. Martin said there was fraud “everywhere” and that Adams was the “last person on this platform to talk about fraud, or to talk about anything like that, given the baggage that you’ve come with from the past”. “I did my job in the North,” said Mr Adams. The 90-minute debate mostly focussed on restructuring of the banks, jobs, emigration, taxation and health. It saw repeated arguments between Fine Gael leader Enda Kenny and Labour leader Eamon Gilmore on policy issues, with Mr Kenny rejecting Labour claims of a 5 billion euro “black hole” in its financial calculations. Mr Adams repeatedly warned that none of the other parties said they would halt a 30 billion euro taxpayer payout to the bondholders of the bankrupted Anglo Irish Bank next month -- a figure which dwarfed the spending and taxation issues raised throughout the debate. Labour Party leader Eamon Gilmore accused the Sinn Féin leader of “fantasy economics” but refused to say whether, if elected to government, he would also back the payout. During the debate on state-run television, which was chaired by Pat Kenny, the leaders answered questions from members of a studio audience of about 140 undecided voters. The first question, from a man whose three children had emigrated, asked the leaders to explain their strategy to help Ireland survive. Mr Adams called for a real republic based on genuine republican values, with the rights of citizens respected and enhanced. He said people had the right to work and his party would invest to create jobs. Creating jobs was the most important thing that politicians could help do, he said. Mr Kenny said it was “an obscenity and a scandal” that Fianna Fail and the Green Party had pumped 100 billion euro into the banks. He said that by 2016, he wanted to make Ireland the best small country in which to do business. Mr Martin attacked Mr Adams’s approach to the banking crisis, questioning where Sinn Féin would find the money needed to pay the salaries of State employees over the next four years. He claimed Sinn Fein’s promises to sustain the economy without a loss of sovereignty were like those of a “magician”. “[Prominent television magician] Paul Daniels couldn’t tell it the way Micheál Martin is presenting it,” Mr Adams quipped. Mr Adams also vowed Sinn Féin would not put “one red cent” into the banks until they were restructured and acting in the common good, and would use 7 billion euro from state reserve funds to help create jobs. Mr Gilmore also told the audience that Mr Martin was “the great pretender”. “He’s pretending he wasn’t in government for 14 years, he’s pretending he wasn’t Bertie Ahern’s apprentice, he’s pretending he wasn’t Brian Cowen’s salesman. Many commentators saw the clashes between Labour and Fine Gael -- putative coalition partners -- as a sign of Labour frustration over the latter’s advances in the opinion polls, which suggest Fine Gael could yet form a single-party government, possibly with the support of independents. On the other hand, Martin’s attacks on Adams have been linked to a desperate rear-guard campaign by Fianna Fail to hold off Sinn Fein. Party canvassers are also said to have pointed to the ‘spectre’ of Adams becoming leader of the opposition in the Dublin parliament, ahead of Micheal Martin. There were some ‘afters’ today between Sinn Fein and Fianna Fail, who were accused of attempting a “smear campaign”. Mr Martin claimed Mr Adams had a huge credibility issue about “his past”, accusing him of failing to reveal his IRA role. “He can’t really talk about truth, honest and transparency”, he said. He also said former Taoiseach Bertie Ahern was “convinced privately” that the Sinn Fein leadership had prior knowledge of a bank raid in Belfast in 2004. Speaking on radio this lunchtime Mr Adams said Sinn Féin was not interested in negative campaigning and said his party was bringing forward practical proposals and solutions. “Micheál Martin is engaging in a smear campaign against myself and Sinn Féin in an effort to mask the fact that Fianna Fáil offers no real solutions and no real proposals to kick-start the economy, sort out the banks and get people working,” he said.